It's no secret that customer expectations are growing every day. As such, many companies has no alternative but to expand their support channels from conventional email and web portal to social media platforms such as Twitter and Facebook so that they can support their customers where they feel most comfortable. With Trakdesk, you can support your customers wherever they are. Tweets and Facebook messages can automatically be converted into support tickets and assigned to the correct team. Additionally, Agents and customers can interact within each support ticket, allowing you to capture all interactions so that nothing slips through the cracks. Select the Social Accounts option. At the Top Right of the page, click on the drop down menu and select Add Twitter Account. Your browser will automatically redirect to twitter for authorization. Enter your twitter account username and password to authorize your helpdesk to connect to your twitter account. Once authorized, you will be redirected back to Trakdesk. You can then configure the account to meet your requirements. Finally, click on the Save Changes button to save changes. Login to your helpdesk as an agent. Click on the Social Feed option in the navigation menu. Under Social Accounts, click on the twitter account to view all tweets. In the tweets view, you can perform actions like, replying to tweets, re-tweeting tweets, like tweets, creating support ticket and also view tweets on twitter. Additionally, you can post new tweets from your twitter accounts by clicking on the Compose a tweet option. 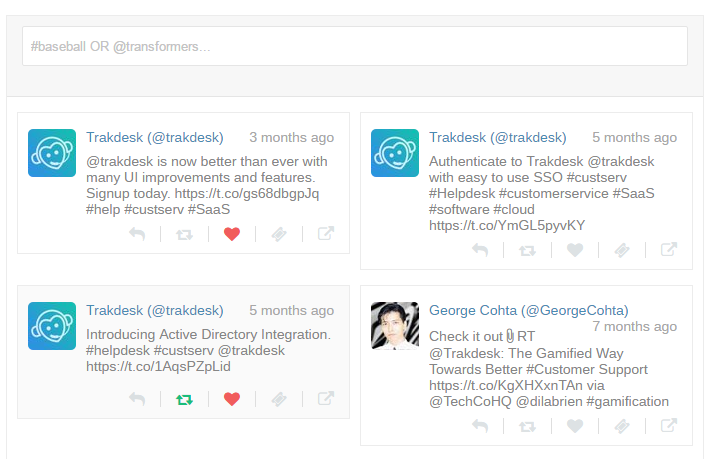 With Trakdesk twitter integration, you can reply to tickets that were created from tweets and direct messages directly from your helpdesk in seconds. Reply via tweet - Public twitter message. Reply via direct message - Private twitter direct message. Reply via Email - Available only if the requester has a valid email address. Reply via SMS - Available only if Twilio SMS app is installed and configured. Upon clicking Authorize on the Twitter Website it attempts to redirect me back to Trakdesk but fails and provides an &quot;Invalid Parameters&quot; error.&lt;br /&gt; &lt;br /&gt; Same thing happens for both Twitter and Facebook. Hi Jamison,&lt;br /&gt; &lt;br /&gt; You are getting the error because you have disabled social login. 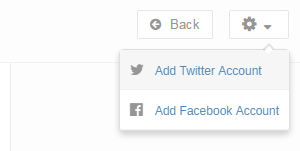 Go to Admin -&gt; Customer Portal -&gt; Settings and enable Facebook and Twitter social login options. After you have saved the settings, try to add your Facebook and twitter accounts again.